Chewy Chocolate Coconut Cookies -- Allergy-Friendly & Oh-So-Dippable! You know you're on to something good when your husband says that! These chocolate-coconut cookies are also allergy-friendly. Grain-free or gluten-free? You're covered. Use coconut oil instead of butter to make them dairy-free. Eggs? There aren't any. And the texture? On the first day, they're crystally crispy on the outside and chewy on the inside. Perfect, perfect, perfect. 😉 As the days go by (if they last that long), the crispy outside softens up, but they remain delectably chewy and soft. Sweetener? Good ole' honey. Use a mild-flavored honey if you can — stronger-flavored honey can be overpowering. They're really fabulous. I mean that — totally a hit. Make some today! Adapted from Paleo Chocolate Chip Cookies at Ancestral Nutrition. Combine honey, melted butter (or coconut oil), vanilla, and cocoa powder in a medium mixing bowl. Whisk until smooth. Add almond flour, baking soda, and sea salt. Mix with a wooden spoon or a Danish dough whisk. Mix until all the flour is wet with the honey/butter mixture. Add shredded coconut. Mix well. The cookie mixture should be sticky but still hold together well when shaped into a ball. Line a baking sheet with unbleached parchment paper. With a spoon or cookie scoop, place about 1 tablespoon of cookie dough onto the parchment paper, then press down with your fingers to shape each cookie into a round 1/4″ to 3/8″ thick cookie. Repeat until the tray is filled with cookies 1/2″ to 1″ apart. Fill additional trays to bake more at the same time, if you'd like. Put tray(s) in the oven. Any trays on lower racks will probably need to be moved to the top of the oven to finish browning. Bake for 10 to 12 minutes. Cookies are done when the coconut flakes are golden brown. Right out of the oven, they're quite fragile. Store in an airtight container, using leftover parchment paper to separate layers of cookies. Enjoy! 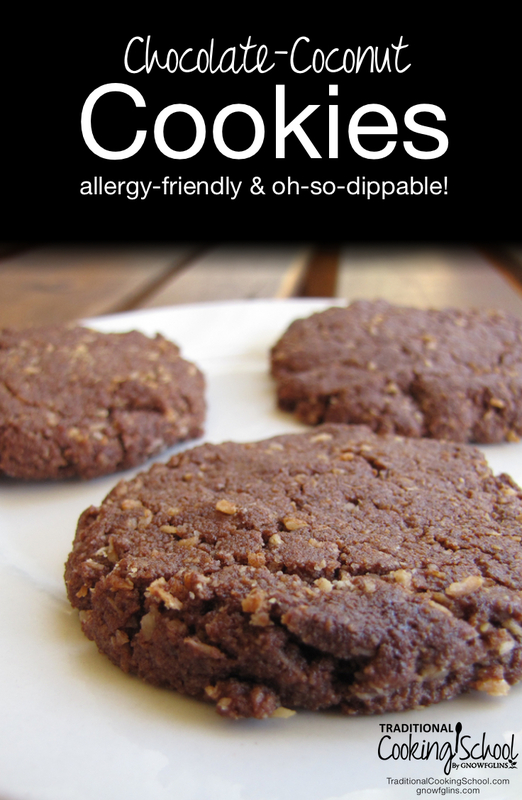 Check out our Allergy-Free eCourse for more allergy-friendly recipes! Enjoy! Please share — what's your favorite dippable cookie recipe? Or allergy-friendly cookie? Feel free to share links in the comments. Delicious. I’m curious if you’ve tried a variety without cocoa? Would it need more flour? I wonder if this can be done with a different flour.. like coconut flour or tapioca flour. They look so yummy! These look incredible! I haven’t seen a dippable cookie in a while. Nice work! Are these or the dough freeze-able? They look and sound AMAZING. I can’t wait to try them. I am going to try these with stevia instead of the honey. They sound amazing. I am thinking the same thing I am trying to use mostly stevia, I think I will try 1/2 C honey and two eyedroppers of stevia liquid organic from Trader Joe’s my fav no chemical aftertaste. Jan — One other thing to keep in mind is that the honey provides the liquid for the cookie dough. You’ll probably need to use eggs or more fat to account for the loss of honey. I tried your recipe with some adaptations for lower sweetener as I have a paleo anzac cookie recipe that is similar. I used half the amount of honey and substituted with unsweetened dessicated coconut as I like a finer texture. Also used cacao powder. Then used enough water to make the dough wet enough to form cookie balls. Yummmy! Thank you. I have previously used carob powder instead of cocoa in a muffin recipe and found that sweeteners could be halved or quartered as carob is naturally sweet so maybe it might be used for those keen to experiment or needing to be chocolate free. These look delicious! There’s no egg, so have you tried dehydrating them? Sharon, that’s a great idea! No, I haven’t, but I think they would make a great dehydrator cookie. However, not for long-term because of the fat in the recipe. I just made these and oh my goodness yummy! I must have messed something up cause mine are quite flat, but I just don’t care. They remind me of one of my favorite childhood candies, those coconut Neapolitans from Brachs I think. I was craving one the other day and found them. I was quite excited until I read the ingredients, or at least tried to since I didn’t know one of the words. Anyway, I thought that craving would never be satisfied. It is now. Thanks so much! These look wonderful, but the title is a little misleading. Allergy friendly would make it free from common allergens, and tree nuts are a major allergen. I was hoping this could be something safe to take to our homeschool co-op, but as we have three children there with life-threatening tree- nut allergies, that’s not going to work! Wow, these are very good! I’ve been a baker for 30+ years and haven’t had cookies this good since we went grain and sugar free, thanks so much for the recipe. I made them with coconut oil for my grandson who is on GAPS, it was his Halloween treat! Is that really 4 and 1/4 cups of Almond Flour? Seems like a lot. my daugther is allergic to wheat and nuts. is there another type of flour that I can use? I have had great luck substituting soaked, sprouted and dried ground sunflower seeds ( sunflower seed flour) for almond flour in most recipes. We have tree nut allergies here also, but they can all tolerate coconut and sunflower seeds so it works for us. Has anyone tried making this into a bar cookie? I was excited to try these… but as a mother of a child with a nut allergy (one of the most common deadly allergies), I’d say it’s grossly innacurate to call these allergy-friendly. These cookies are allergy friendly in her world. Not every recipe on the world wide web is going to be allergy friendly for all people. why raw honey and not regular honey? also, do you warm the honey to soften it? No allergies here, so could reg. Whole wheat flour be used? And same amount? I made these with half the honey and an egg and as soon as I took them out of the oven, set a choc chip on each cookie to melt and then give it a swirl. Scrumptious! Just made these and they are delicious! Will share this link on fb. Thanks for the great recipe! Wowzers. These were delicious. Best GF, DF and refined sugar-free bickies I’ve made in a while – and I’ve been experimenting with a lot of recipes lately. Defiantly pinning this one! Thanks so much.